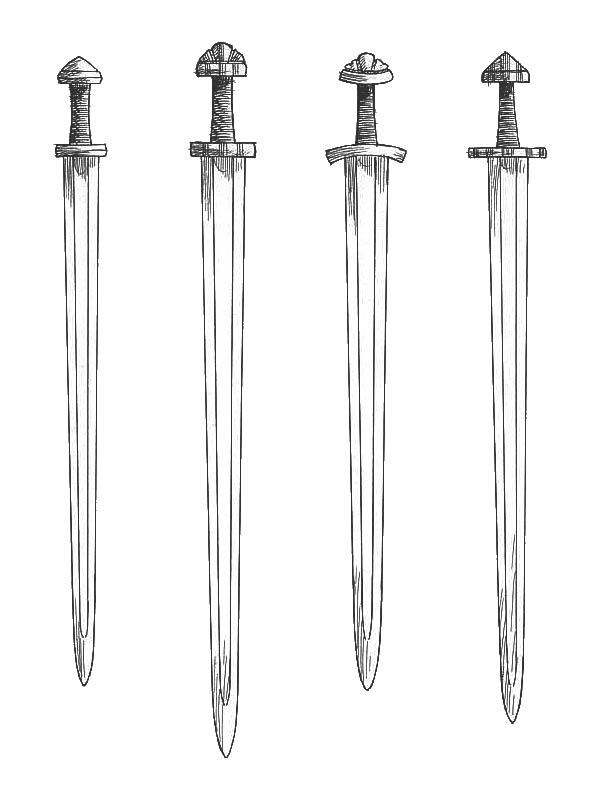 In 1919 Dr. Jan Petersen developed a typology for swords used during the Viking Age. Petersen's work was exhaustive and every Viking typology developed since has been based on it. In 1927 Dr. R.E.M. Wheeler condensed Petersen's 26-member typology into a more streamlined 9-member group. When the late Ewart Oakeshott developed his typology of the medieval sword it was only natural that he begin where his fellow scholars had ended. Consequently, Oakeshott designated the first member of his system with the Roman numeral X as a means to illustrate a continuance from Wheeler's designations of I through IX. Seeing use throughout the Viking Age and well into the Middle Ages, the Type X was arguably in use longer than any other blade type. While the basic form of the blade did not see dramatic changes throughout its life span, there were changes in its geometry. In 1991 Alfred Geibig developed a typology that outlines these changes as they occurred during the Viking Age. Both Petersen and Wheeler emphasized hilt design, largely ignoring the details of blade design. Geibig's real contribution to the study of the sword comes from his categorizing of the Type X in terms of changes in blade length, fuller length and shape, profile taper, and point design. The typology outlined by Geibig shows a clear progression from the round pointed, parallel edged, swords of the Migration era to the sword that would begin Oakeshott's typology. "A broad, flat blade of medium length (average 31") with a fuller running the entire length and fading out an inch or so from the point, which is sometimes acute but more often rounded. This fuller is generally very wide and shallow, but in some cases may be narrower (about 1/3 of the blade's width) and more clearly defined; a short grip, of the same average length (3 3/4") as the Viking swords. The tang is usually very flat and broad, tapering sharply towards the pommel. The cross is narrower and longer than the more usual Viking kind--though the Vikings used it, calling it "Gaddjhalt" (spike-hilt) because of its spike-like shape. Generally of square section, about 7" to 8" long, tapering towards the tips. In rare cases curved. The pommel is commonly of one of the Brazil-nut forms, but may be of disk form." The Type X clearly shows its lineage from its ancestors of the Viking Age. In fact many of the blades Oakeshott uses to illustrate the type may very well have been manufactured during the Viking Age. Many of these blades bear their makers mark in the form of iron-inlayed inscriptions, with the name +ULFBERHT+ being the most common. These inlays begin to surface during the Viking Age and can be found on much later swords dating from the high Middle Ages. Either Ulfberht was an extremely long-lived sword maker or what we see here is one of the earliest forms of brand recognition. Like the names of Ford, Ferrari, Colt, and Winchester, the founders name obviously lived on in the form of the company that survived him. 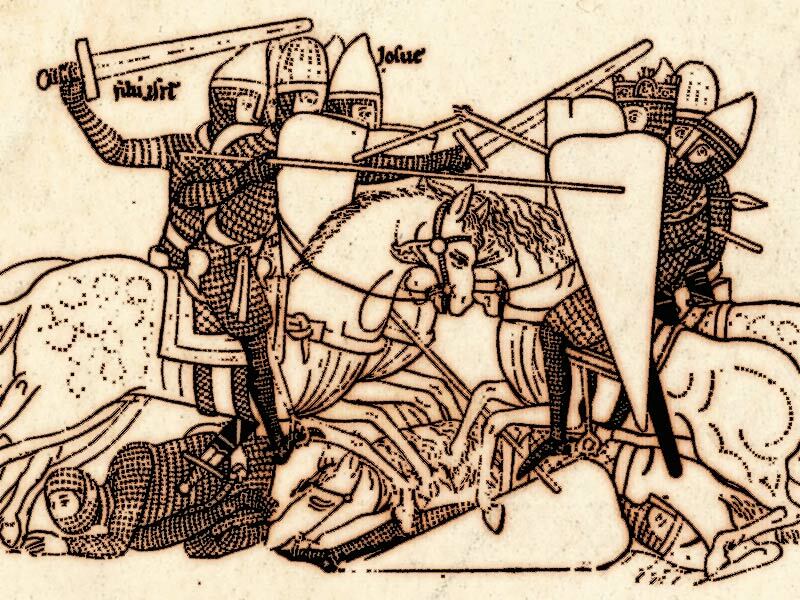 Names such as Ingelrii and Leutfrit have also been found but not on nearly as many blades as the medieval corporate giant that Ulfberht obviously was. Many of Oakeshott's Type X blades have inlays that are obviously forgeries, as they have been misspelled. The illiterate knight of the Middle Ages may very well have been the first victim of trademark infringement. As characterized by Oakeshott, the Type X features a blade that is broad and massive at the base and features a moderate taper towards the point. Sometimes the point may be of a rounded or slightly more acute profile. This type of point would have been fairly effective when used against the lightly armored warriors of the Viking and early Middle Ages. Regardless of the point's profile, the Type X is definitely a sword oriented towards the cut. The blade typically features a lenticular cross-section that is very flat and relatively thin. Its breadth is countered by the use of a fuller that is typically broad and runs nearly the entire length of the blade. The end result is a blade that is massive in proportion yet lively in its handling characteristics. The Type X would have been capable of large shearing cuts that would have provided a decisive conclusion to any encounter. Against the mail clad warriors of its day, the Type X would have given good service. In 1980 Oakeshott created a sub-variant of the Type X which he designated the Type Xa. Oakeshott had originally put all examples of this variant into the Type XI classification. The Type Xa does not, however, share the Type XI's long slender blade profile. While it has the same broad blade profile as the Type X, the fuller of this subtype is distinctly narrower in width, yet it maintains the same length running out to the tip. This may be a fine distinction, being judged by the singular detail of the fuller's width, but Oakeshott felt that it was important enough to be added to his typology. Oakeshott's Type X may seem to be a rather simplistic form when compared to the blade designs of later periods; however, in reality the Type X is a design that clearly illustrates the complexity of the blade maker's art. In the Type X we have an excellent example of the critical combination of geometry and mass distribution. If these elements are not properly combined the result will be a blade that is fragile or overly heavy. Swords of this type are proof that the medieval mind had a firm grasp on the principles of geometry and proportion. This sword dates from 900-950 and is in excellent condition, despite being found in the River Thames. The 29" long blade is inlaid with the letters INGELRII in iron. Dated from c. 900-950, this piece was found in the River Witham near London and is nearly perfect save for some erosion on the edges and slight pitting. The name LEUTFRIT (with the first "T" upside down) is inlaid in iron on one face of the blade; the single letter "S" inlaid on the other. This late ninth century piece has a 31" long blade with nearly parallel edges and shows signs of being broken and subsequently re-welded, perhaps in antiquity. The cross and pommel are in excellent condition. A giant snake running down the fuller is inlaid on one side of the blade. Another ninth century example, this sword is generally well preserved, with areas in almost pristine condition. The blade is 31.5" long and has its cutting edges still in-tact as well as excellently defined fullers. An excellent "Gaddhjalt" (Spike-hilt) example, this sword is datable to the Viking period, circa 950. Its 30.625" long blade has an iron inlay reading INGELRII. Despite being a river-find, it's in good condition with light pitting overall concentrated at the point. This important sword is another example found within the River Witham near London. It's datable to circa 1100-1150 and is in nearly perfect condition. Fairly unusual for its type, it has double fullers running nearly to the point with inlaid letters inscribed on one side of the 31" long blade and a series of symbols on the other. This ninth century example was found in Billinderry bog drainage ditch, Ireland. 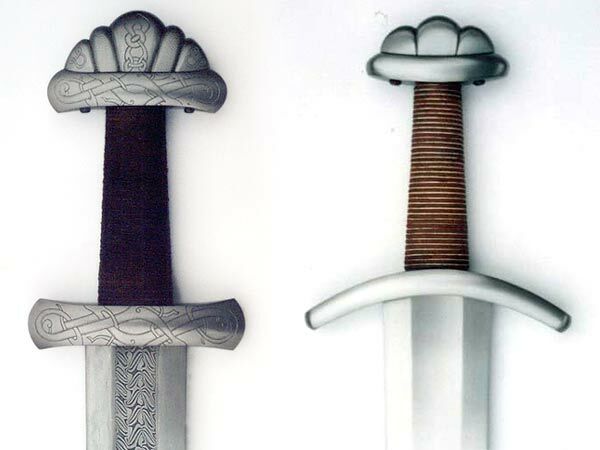 The hilt is decorated with vine-like scrollwork and plated with silver. The 31" blade bears the inscription +ULFBERHT+ and the upper cross bears a HILTIPREHT inscription. This piece is one of five similarly inscribed hilts, and is perhaps the most exquisite find made in Ireland to date. Not much is known of this excavated sword. it is presumed to be circa 1100-1330. The condition is nearly perfect, with no pitting beneath the hard patina, except for near the tip of the 33.75" long blade. The 34.5" long blade has a well-made inscription reading +NINOMINEDOMIINI+ on one face and a Cross Potent on the other. Oakeshott dates this example circa 1050-1100. This sword has a 33" long blade, dates c.1100, and was found near Newbury, Berkshire. Its excavated condition is generally very good, with signs of inlays on the blade (iron inlay all lost). Datable to 1050-1125. Excavated but good condition with considerable pitting. No traces of inlaid inscriptions anywhere on its 34" long blade. The hilt of this sword, c.1100-50, is better preserved than its blade. The surfaces of the 32" long blade are mostly corroded, especially the tip section, which is nearly gone. This sword, circa 1100 and with a 33" long blade, is in poor condition with heavy pitting on both sides. The blade edges are worn away. The hilt is identical to a sword from a Viking grave at Tryvaa in Finland. Another river find, this sword is a fine example of the "Gaddjhalt" form and is similar to the INGELRII sword above (X.5) but with a longer than average 35" blade. It's in excellent condition, still having good cutting edges and showing evidence of use. A Cross Potent and evidence of iron-inlaid inscriptions appear on the blade. This piece is datable to the mid tenth to mid eleventh century. The Viking sword saw diverse variety in its hilt form and decorations, but their blades saw very little. A vast majority of swords depicted in Viking artwork belong to the Type X family and its subtype, the Xa. Over 300 years of raids by Viking warriors are captured in the many dozens of sagas and stories left to us. We're told of heathen warriors using devastating weapons to sack peaceful towns and hoards of plundering and trade-seeking Scandinavians entering the British islands. "Egil bade Ljot make himself ready; 'I want this fought out,' he said. Ljot sprang to his feet, and Egil ran forward and at once struck him; he went so close that Ljot stepped back, and his shield did not cover him. 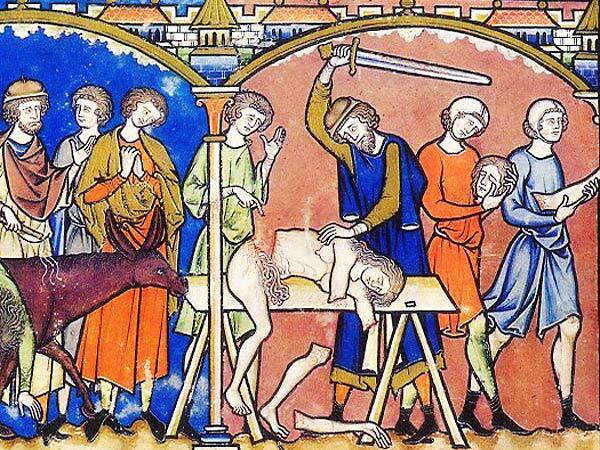 Then Egil smote him above the knee and cut off his leg. Ljot fell, and at once died." 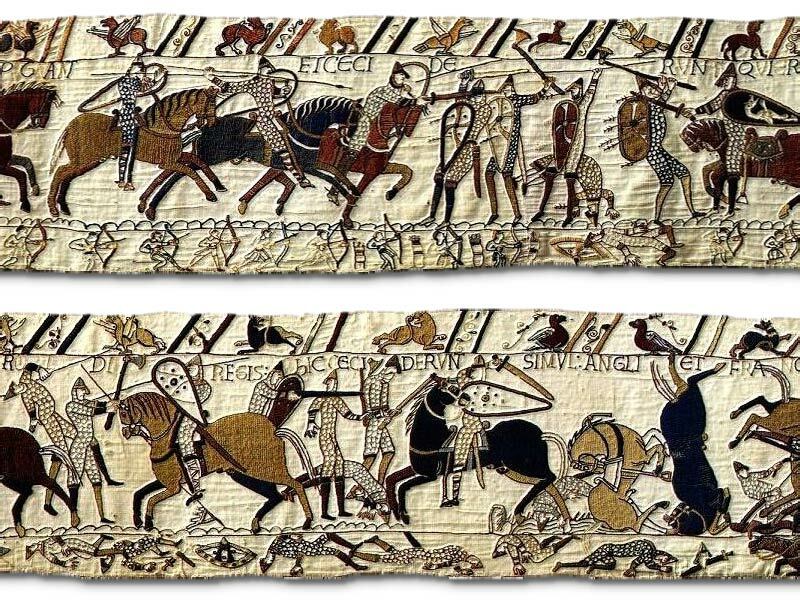 The Bayeux Tapestry is one surviving source that denotes Norman warfare, tactics, and equipment and is perhaps the most comprehensive, though not the best, source of information regarding eleventh century military armament. Within the Tapestry are shown warriors fighting with spears, axes, occasionally a club or mace, and of course the sword. Many of the swords being depicted are of Type X or Xa classification, with their long, wide fullers clearly visible. 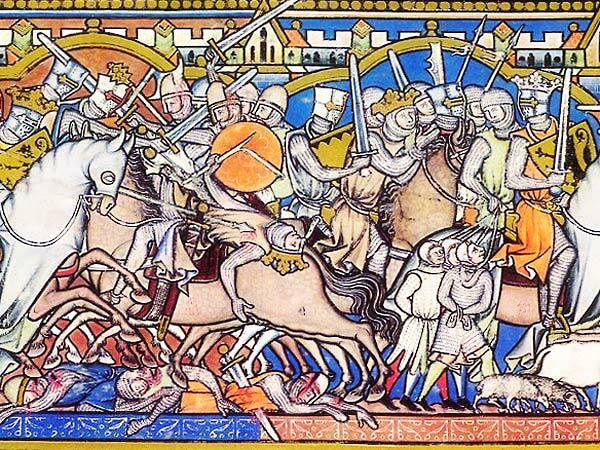 Of French origin, the Maciejowski Bible, illustrated circa 1250 by unknown Parisian artists, was commissioned by King Louis IX (1214-1270). It serves as an excellent compilation of minute pictorial details of arms, armour, warfare, and the daily life of ancient people. The Type X and Xa are some of the most well-represented sword types avaialable on the reproduction market. The catalog of available swords includes styles of the Viking period and spans into the Middle Ages. Albion Armorers has several models available spanning their various product lines. Next Generation: Vinland, Gotland, Clontarf, Hersir, Huskarl, Jarl, Valkyrja, Thegn, Gaddhjalt (Xa), Norman (Xa), Templar (Xa). First Generation: Hastings, Stamford, Gaddhjalt. Squire "Viking Sword". Their Clontarf looks to be based on the X.8 Museum of Ireland example, above, and the Next Gen Gaddhjalt on the Xa.7 From the Musée de l'Armée. The Jarl uses X.2 as one of its inspirations. Angus Trim Swords offers the AT1211, AT1212, and a Type Xa called the AT1215. Del Tin Armi Antiche has over a dozen examples, including their DT2100 through DT2105 models and the DT2070, DT2071, DT2080, DT2120, DT2130, and DT2133. Arms & Armor has a single offering: The #049 Shifford Viking Sword. 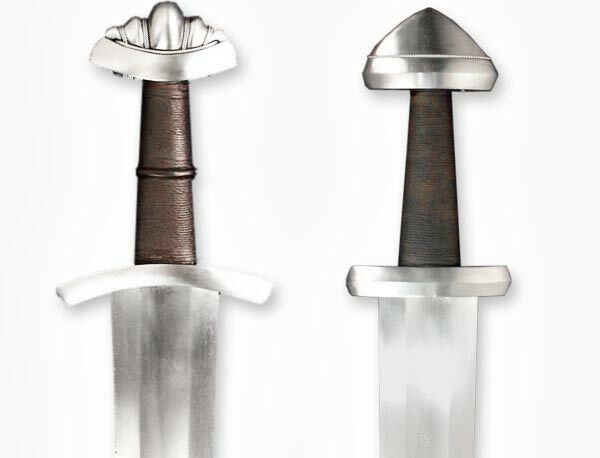 Museum Replicas Limited carries several models in their lineup, including their River Scheldt Viking Sword, Classic Medieval Sword, Sword of the First Crusade, and Damascus Viking Sword. Custom makers like Patrick Bárta of TEMPL Historic Arms and Vince Evans have made some highly researched and accurate reproductions of historic examples. The X.6 From the British Museum, shown above, was created by Vince Evans and was the subject of a review on this site. We also have a hands-on review of a custom Peter Johnsson 13th Century Type X sword. The many surviving examples of the Type X attest to its popularity during both the Viking Age and the early Middle Ages. The type was obviously effective when combined with the military tactics of the day. The Type X has also become a popular favorite with the modern sword lover. As the comparative samples show there are many replica swords, both production and custom that feature blades of Type X design. The massive appearance and effective cutting ability of the Type X make it just as popular with the modern-day collector and practitioner as it was with the real-life warriors of the age of mail.